Lionsgate has released the first official look at Sylvester Stallone in Rambo 5: Last Blood. Stallone has posted some pictures and video from the set, but this is the first image from the highly anticipated sequel that the studio has released. Stallone's John Rambo can be seen wearing a black cowboy hat along with a poncho in the rain. The image obviously doesn't spoil anything about the story of Rambo 5, but Stallone looks pretty badass staring down the camera. The picture has a caption, which reads, "Time to become war. Sylvester Stallone is back with your first look at Rambo V: Last Blood." Rambo 5 was talked about directly after the last film in 2008. However, it has taken eight years to get the project on track. Sylvester Stallone's first idea was to adapt the horror/action novel Hunter by James Byron Huggins for the Rambo franchise. That idea was later abandoned, but Stallone is resurrecting it for a standalone adaptation that won't have anything to do with Rambo, which is definitely for the best. Production on Rambo 5 recently started, and as usual, Sylvester Stallone has been giving fans regular updates on social media. We've seen the actor on set as a cowboy and riding a horse, but we haven't seen any other members of the cast as of yet. Stallone also recently revealed that he's still fine-tuning the script as the sequel continues to film. The actor is a very busy man these days, and as he says, "a writers job is never done..." which leads one to believe that he will still be tinkering with the script as the production moves along. While filming is currently underway for Rambo 5, Sylvester Stallone will more than likely have to take a break in order to join Michael B. Jordan on the promotional campaign for Creed 2. That sequel doesn't hit theaters until the end of the month, but it's already on track to make more money than the first installment during its debut weekend, which is excellent news for all parties involved. There will be some competition with Disney's Wreck-It Ralph 2, but Creed 2 should still end up doing really well. Rambo 5 currently does not have a firm release date, but it is believed that it will hit theaters in the fall of 2019. Sylvester Stallone will keep us all in the loop via his social media accounts, so we really don't have to worry about missing that important piece of information. As for what's next for John Rambo, that isn't clear at the moment. 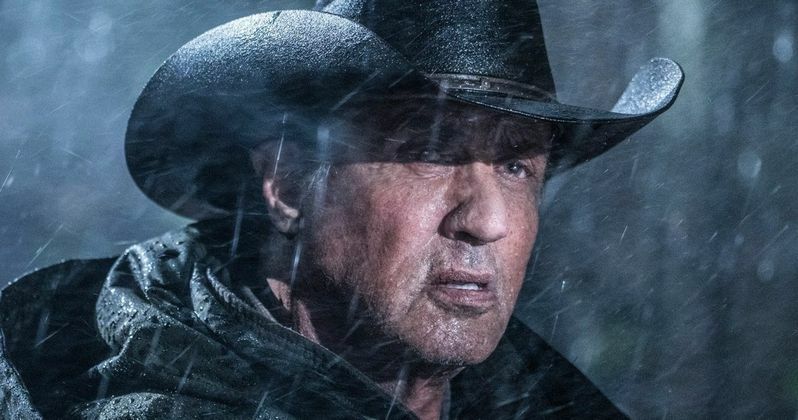 There have been whispers that Rambo 5 could be the last time that the 72-year old plays the iconic character on the big screen. Whatever the case may be, we still have Rambo 5 to look forward to. While we wait for release date info, you can check out the first look image of Stallone as John Rambo below, thanks to the Lionsgate Movies Twitter account.